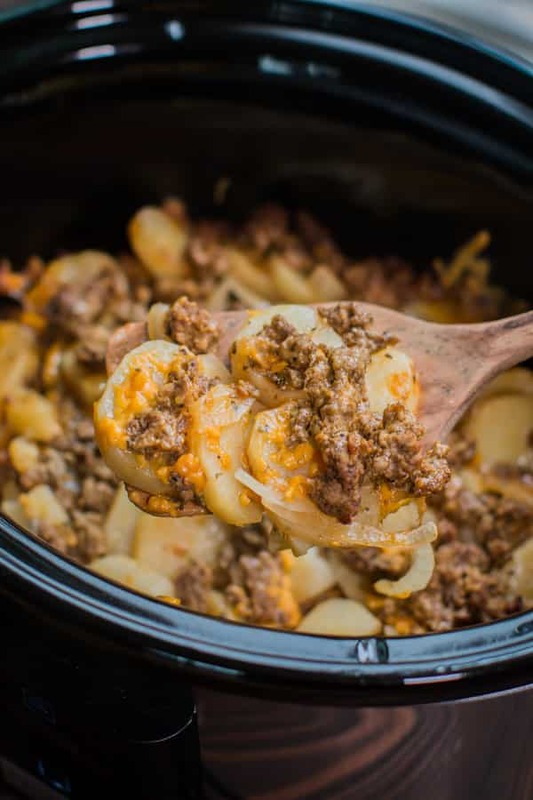 This Slow Cooker Beef and Potato Au Gratin is an easy from scratch hearty meal! I can eat au gratin potatoes by the plate full! I decided add ground beef to homemade potatoes au gratin and came up with this fabulous hearty meal. I really enjoyed creating this recipe. I knew that the potatoes would need some heavy seasoning, so I went heavy with the salt and pepper, but also added garlic powder, paprika and parsley. The potatoes go in the slow cooker peeled, though I don’t mind skin on for most recipes this one tastes great without. I made a new style of video, where I do photos for the different layers that go down in the slow cooker (instead of video the entire time). The first take was a mess, most of my photos were blurry and I kept kicking my tripod legs and that made the photos not line up. Thankfully day 2 of photographing went great. I also had the pleasure of eating this delicious meal two days in a row, life’s rough. You can follow me on YouTube here, if you want to see more of my slow cooker videos. I hope you have a great week,will be back next week at some point. I may only have one new recipe next week due to Lola being out for Spring break, I don’t know what she has planned for me. Until then I hope you try this newest recipe, it’s one of my new favorites. Brown the ground beef on the stove top, drain fat. Add a touch of salt and pepper to season. Add half of the potatoes in the slow cooker. Sprinkle over half of the onions, half of the seasonings, half of the meat, and half of the cheese. Repeat the layers again. Cover and cook on high for 4 hours. Do not open the lid during the cooking time or the potatoes will not get soft. 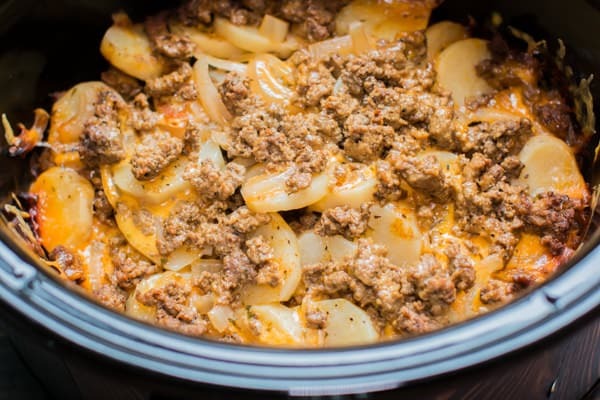 I used my 6.5 quart Touchscreen Crock-Pot® for this recipe. Though any 5-quart or larger slow cooker can be used. This looks so good it made my mouth water!! Can’t wait to try it! I haven’t tried, but I would think about 6-7 hours. Could I do this on low for 8 hours?? A person commented that they did this for 8 hours and it worked fine. I haven’t tried this myself yet, sorry! I would add a touch more broth if I was going to attempt that. How would you cook this in the oven? I want to make it tonight, but won’t have time to put it in the crockpot. Most comments here seem insane, as does the original directions. 4 hours? 8 hours? Hat are you making? Mush? When I make pot roast, my potatoes are WHOLE, but I do not add them until the sizable chunk of beef has cooked for 2 hours. I cook the potatoes and other vegetables for a hour, and they are very soft. Thin sliced, they will become mashed potatoes without mashing. Hi Kenn. I could and video tape exactly as I write the recipe. Maybe your slow cooker cooks hot. The slow cooker takes about 2 hours to heat up, so the veggies aren’t cooking much the first 2 hours anyway. 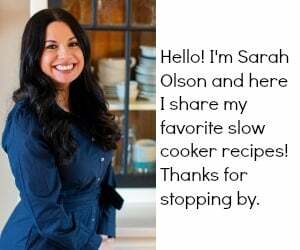 What slow cooker do you recommend? 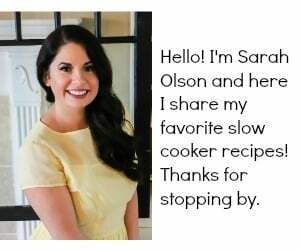 I love any Crock-Pot® oval 6-quart slow cooker. They range in price depending on if they have a timer or how fancy the timer is. I just bought the Crock Pot 6qt, 5-in-1 multi cooker. 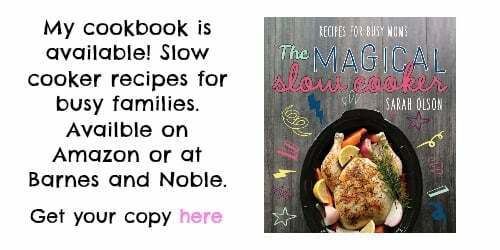 It is a slow cooker (with high and low settings), a steamer, brown/saute, bake and roast. I used it for the first time yesterday and made a meatloaf with veggies. I have a different multi cooker (Ninja) but it cooks way too hot on all modes. Hi Laura! I have that slow cooker. I really like it, it doesn’t cook near as hot as others, I either cook things longer or crank up the heat if needed to the brown/saute or oven if I need a meal faster. Can you add milk so it is creamier? You could instead of broth, though I am unsure if it would curdle in that amount of time. I made a “gravy” with milk, butter and flour and mixed it in about 5 minutes before serving it. Milk may work, unsure if it would curdle though. I dotted mine with butter and it turned out great. Great meal! I was needing a way to use up 1 lb of ground beef and this was perfect. Hello everyone! I have the beef/au gratin cooking now. I have quite a bit of potatoes left. First layer I put about 3 layers of potatoes and about the same on the 2nd layer. Did I cut too many taters or do you use that much in 1 layer? My pot was almost totally full when I stopped. Help!!! Hi Larry it should be fine! Add a bit more cheese and a touch more broth if you have it. Also leave the lid on the entire time. Thanks Sarah!! I just loaded my plate and it is very good indeed!! Right now, my wife is Chinese and went back to visit for a couple months, so I will be eating this for several days!! Again, thanks a bunch!! Have a great weekend!! That’s great Larry! This meal does heat up well for leftovers. Thanks for your nice comments. 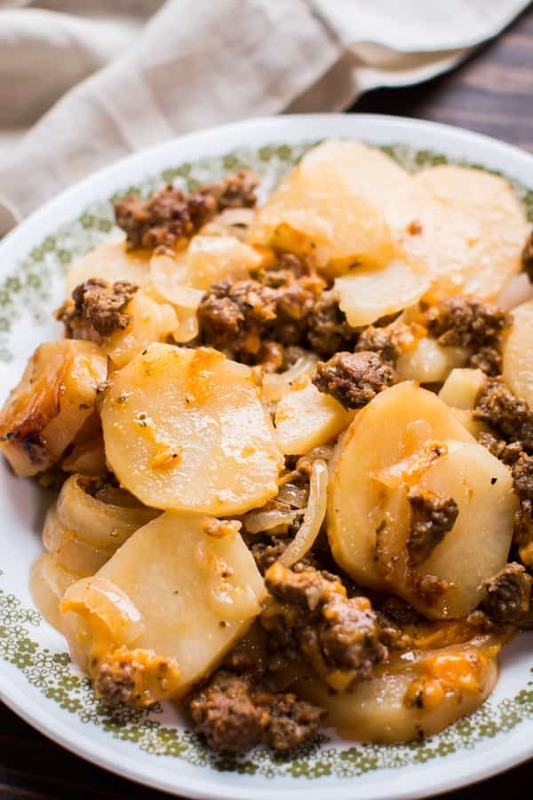 I made this a few weeks ago for dinner, since my hubby is always requesting a meat and potatoes dish. It was all gone by mid day, the next day. He requested it again today. I just finished print everything in the crockpot, so we’ll be having it for lunch. An easy task for the 1st day of my 3 day mini-staycation! Thanks for the recipe! My husband is allergic to onions, all kinds, is there anything you could suggest to add to this instead of onions? Hi Lauren, that’s a hard question, so is garlic not an option either? I would add maybe bell pepper or even more seasonings such as thyme or even celery salt. Sorry I am not much help! What is another cheese you would recommend? My husband isn’t a huge sharp cheddar fan. Thank you! I made this tonight for the grandkids and their dad. They all ate it! This one is going on the list of things I like to make that people will eat. I served it with applesauce and a green salad. If it were just us, I’d have make some other kind of veggie side, but we like veggies!. It was fantastic! That’s great Wendy. I love when other enjoy a meal as much as I did. Nice to meet you! Looks very tasty and now that it’s starting to warm up, it’s time to break out the slow cooker again. Thanks for sharing! Hello. I would like to make this on low while I am at work. Please tell me how much extra liquid you would add. Thank you. I just made this exactly per the recipe and it’s perfectly fine and tasty. Not sure what you did wrong. Also, I happen to be an experienced cook as well and in my opinion, this is a perfectly acceptable, hearty slow cooker meal. Hope you enjoyed your McDonald’s. Lol No chef would be caught dead eating the garbage that is rolled out from McDonald’s. So let’s not lie. This recipe certainly doesn’t look fancy to me, but rather a simple and hearty meal. And this is coming from an extremely experienced home cook who runs a food blog. I’ve heard of people cooking potatoes in the microwave before adding to the crock pot. For me, if I keep the lid on the entire time, the potatoes get tender. Make thithis yesterday and it was delicious! I made it the night before and put it in the crock pot in the morning. I put on low 8 hours. I also added a full cup of chicken broth instead of half. So great to hear! Good to know it can be set up the night before. Do you drain the hamburger? Yes, I just added that info to the recipe. Thank you. I have this in the crock pot for tonight’s supper. Do you have any nutritional info, such as amount of protein per serving, calories per serving, and amount of fat. Thanks in advance. Just put this in the crock pot for this evenings supper. Sure hope it turns out good. Don’t see how it couldn’t because we love all the ingredients. 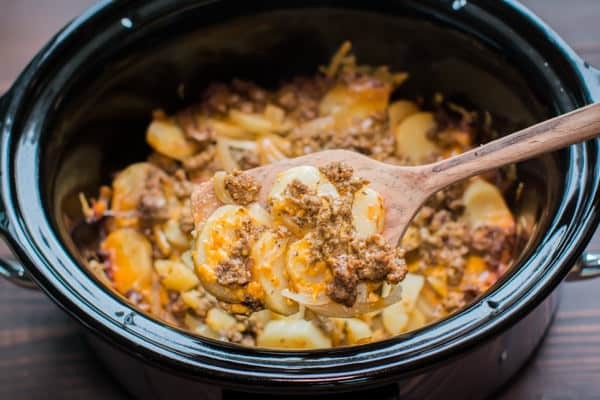 Always trying different crock pot recipes because my husband sleeps days and works nights and it is great to have something in the crock pot so he has a hot meal before he goes off to work. Hopefully there will be left overs for me for a couple of days while he is gone on his run (truck driver). 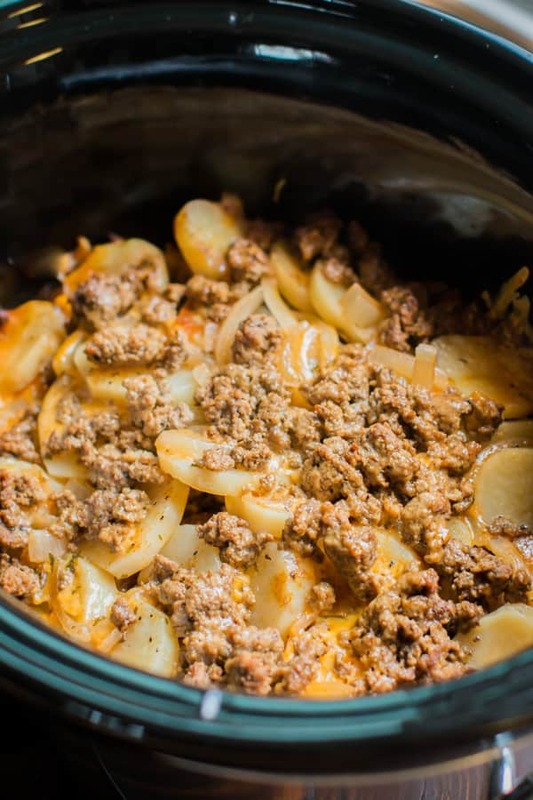 Any instant pot conversion?? I have absolutely no idea how to use this thing and thought converting my favorite recipes would be a good start, I cook dinner daily so I don’t want to have an epic fail night where no one can eat, but I got a new toy and I want to use it!!! I JUST FOUND THIS CONVERSION OF THIS RECIPE. I have it going in my crockpot. A friend of mine told me about it and her family gave it rave reviews. I love the variety of meals you have listed and will be trying them very soon. I’m making this tonight and I’m going to make a cheese sauce using a roux instead of just shredded cheese. It goes a lot further coating over all the food and it will make the entire meal very creamy. looks yummy..will be making this tks Sarah another awesome recipe. We both have the same vintage Corelle plates! I was delighted to see them in your photos! Do you know where the timing would be for an instapot? I made this and it was great but some of the ground beef that was against the wall of the crockpot got burnt. Any tips to fix this? Maybe try a half hour less of cooking time and spray the slow cooker with cooking spray extra well. 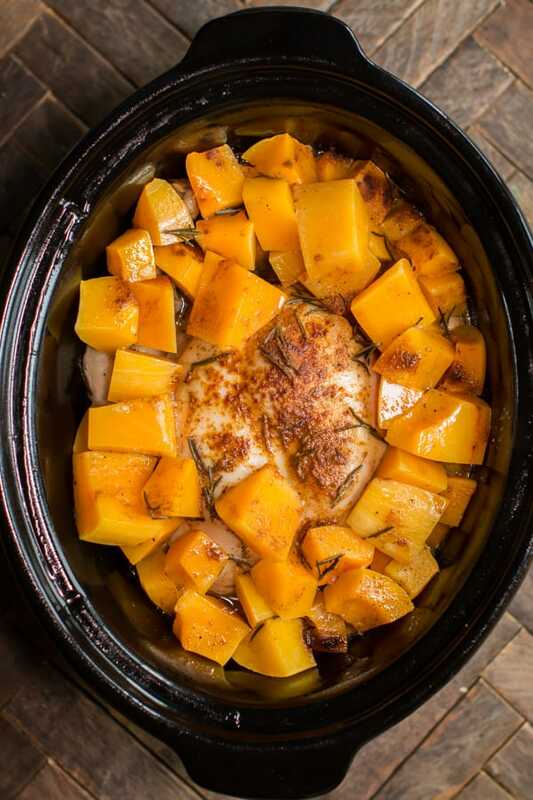 The burning can happen with thicker slow cooker recipes. I know the recipe calls for russet potatoes but can you use red potatoes? I have made this recipe before and we loved it. All I have in my pantry is red potatoes and I’m trying to avoid a trip to the store. Perhaps it would be better if I had remembered to put the broth in. the baby woke and I rushed to start it but it’s Edible with some ranch. Sigh. ☺️ I’ll make it another time with all the ingredients. Looked at at least a dozen similar recipes before I camen back this one and it had been the first one I saw. My non picky family eats everything I make, esp comfort food like this. I made it exactly as written and it smelled awesome cooking all day. Come time to eat? They ate it, but just looked at me like “what is this?” I’m sorry to say, it was a fail. Can’t put my finger on it, but something wasn’t right. I’m just disappointed that there is so much left over and No one will eat it. I cheated. Used frozen hash browns, because I needed to use theme but all else as normal and I just loved it. So tasty and warming in this snowy day! Thanks for sharing!! Thank you for the tip! How easy that will be when I make this again. On it’s own or with a salad. 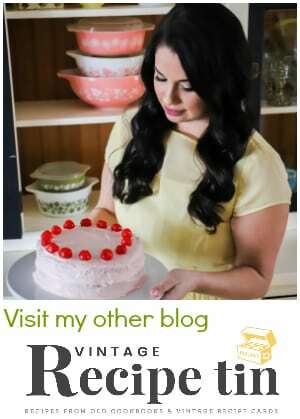 Hi Sarah – by chance can you slice up canned potatoes for this recipe? With arthritis it’s difficult to peel potatoes. Thank you. Hi Kim! You probably could, and cut the cook time way down. You could leave the skins on too! Going off personal preference, I doubled the spices and halved the cheese, used a crockpot liner, and substituted broth made from beef bouillon since it usually has more flavor. Cooked on low for 6 hours since my Hamilton Beach model tends to run hot. Was a success! Served with green beans. I see this calls for a white onion. I have sweet onions. What is your opinion on that. Sweet onion will work fine in this! Do you have nutrition info on this? I made this today and it was so good! I used 1 cup of chicken bone broth and used red onion since that’s what I already had. Didn’t have parsley so I had to omit that. Also didn’t have paprika so I used soul seasoning which has paprika in it. Also sprinkled the meat with onion powder while it was cooking. Was very flavorful, not bland at all. halfway through I turned the heat down to low as it seemed to be cooking too hot. It was done in 4 hours. I have an older crock pot almost 20 years old, so not sure if that’s why. Added a little more shredded cheese to my portion once added to my plate. This is a great recipe and was easy to make. Much better than the boxed version!